Once you get your head around the fact that this is pre-recorded, either in a studio or on location anytime before but definitely NOT LIVE on 9/11/2001, you will see the bad, B level acting for what it is: a scripted movie clip. You see this in every other #HRDPAR, before and after 9/11. It’s instructional to watch these, as you soon learn that there’s no chance they are created LIVE|EVIL on the day of the film’s release. What other movie is created live on the fly? NONE. They take years to make, and the 9/11 movie was no exception. This entry was posted in 9/11 on April 8, 2019 by ab. 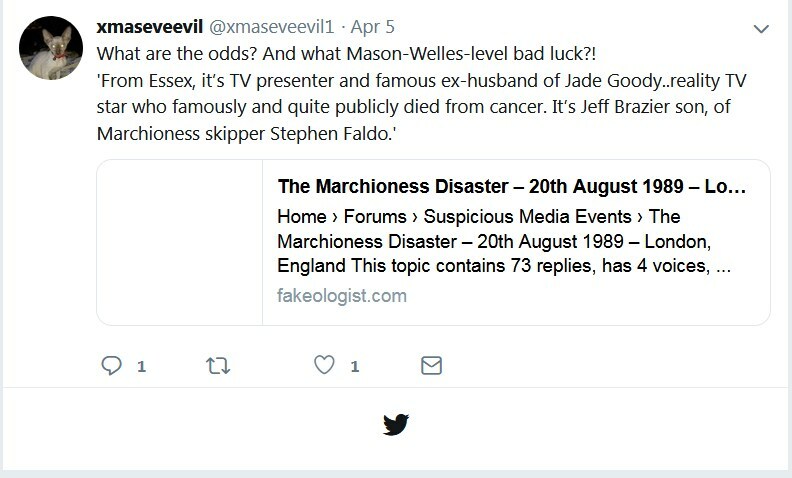 I don’t normally make twitter recommendations, but this guy is one of the few fakeologists on twitter and no where else who meets all the fakeologist criteria. Plus he created a twitterstorm here, doubling our daily hits. Let’s hope he comes on to the discord to chat. This entry was posted in Admin on April 8, 2019 by ab. 9/11 vicsim denier Fetzer sees no victims now. Igan comes across as bad cointelpro with useless points and is no match for filibuster Fetzer who wipes Max’s face in the phony blood. This entry was posted in Psyops and tagged #NZmosque on April 8, 2019 by ab. Fakeologist is Tylenol for the media headache. Nothing highlights that more than whistler anchor stooge Rather. I do enjoy this video. I think I’ll faketube it. This entry was posted in Uncategorized on April 8, 2019 by ab. Welcome UK to Fakeologist.com…! Take a while to spend time listening and reading to this multi media site! The above tweet is causing an avalanche of traffic here – pointing to an old TomD thread. Sometimes it takes a while – what’s going on with interest in this from England today?